Cycles are a tool and should not be used to the exclusion of other tools. There is always the possibility (high probability long term) that the data will be misinterpreted or a relevant fact over looked. So use cycles to check your analysis, not as the only reason to make a decision. Interpretation is the opinion of the author and may be incorrect and should be viewed in that light. 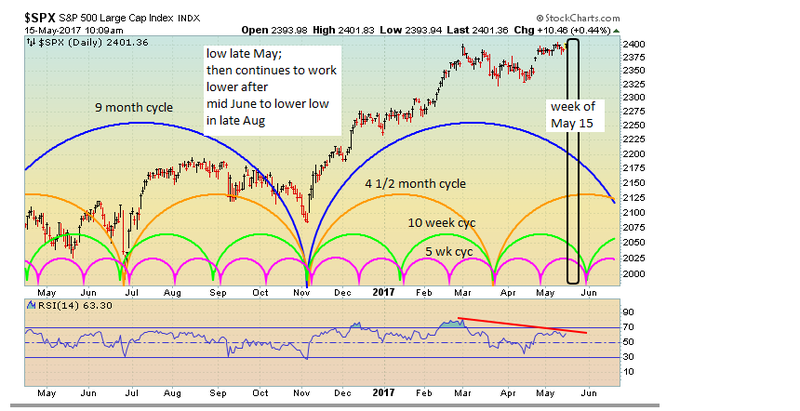 Readers noted inconsistencies in chart posted over week end. Should refrain from posting when not feeling well. Hopefully this is a better chart. I have long been a proponent of TA. I have looked at a lot of different methods. In the 70s I maintained about 50 P&F charts manually (pre Web). Some TA approaches work better than others. In the end I decided that cycles were as good as any, much simplier than most to use and required less time to do. You may have your own TA and I encourage you to use it and only use my post/opinions as a check on your TA.